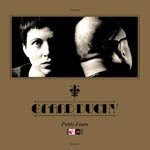 Grand Duchy, aka Black Francis, aka Frank Black, and his wife Violet Clark, is a striking contract, not only because of the albums duel vocal aesthetic, but it unto itself really. This band does one thing very well, and that is defy genres. Their debut, ‘Petite Fours,’ is comprised mostly of label-less tunes that sound unique and somewhat limitless. This record is reminiscent of something Gnarls Barkley would conjure up (minus the dance floor anthems), it is that varied. Actually, in that aspect, ‘Petite Fours’ is sort of like a snowflake, no two tracks are the same, and you really do not know what you are going to get from track to track. Sometimes you will get Francis’ brilliant, recognizable vocals and at others you will Clark’s haunting effervescences. ‘Petite Fours’ houses its share of period pieces, from 1970’s groovy nostalgia to 1980’s euphoric pop bliss, with some modern new wave sprinkled throughout. Sure, some of the album sounds as if it belongs in decades past, but if more of it were to sound similar to ‘Black Suit’s’ gritty 80’s era U2 feel, then this record would be a surefire winner. The album’s opener, ‘Come Over to My House,’ sounds like it could make Beck jealous, while the band does their best drum/bass/synth/subtle guitar Killers impersonation on ‘The Long Song,’ which subsequently is one of the albums’ best offerings. Bear in mind however that being this diverse in sound has its setbacks as well, as ‘Petite Fours’ doesn’t necessarily have a certain identity. ‘Petite Fours’ is a surprisingly good album that will definitely grow on you.